Scan over the last few years of the Department of Transportation’s Capital Improvement Program budget and you’ll see that, one way or another, the city was getting money to cyclists. The fiscal year 2017 CIP earmarked a total of $10.3 million for bike infrastructure over a six-year period. Last year’s forecast ran up to $12.3 million over the same time interval. This year’s CIP stayed steady around $12 million. It calls for a grand total of zero dollars for bike improvements. In fact, DOT has removed the bicycle infrastructure line item from the six-year program altogether. DOT Director Michelle Pourciau presented her budget to the Planning Commission last week. She cited support for Complete Streets – the ordinance the City Council passed last month requiring roadways be designed for drivers, bikers, transit riders and pedestrians – and lamented the way maintenance costs and federal matching restrictions have kept her department from making progress. She said the city spends $30 million of its $86 million capital budget each year on matching federal spending. Unexpected emergency costs – like the recent 26th Street wall collapse and erosion issues on Federal Hill – along with expectations that the city update its “antiquated” traffic signal system, have eclipsed capital improvements. But the disappearance of dollars spoke volumes. Cornish: What Are We Funding? Some were left wondering why DOT was pulling the line item for bicycle initiatives altogether. “If we’re not funding plans drawn up by DOT and passed by the Planning Commission, what are we funding?” asked Liz Cornish, executive director of the bike advocacy group Bikemore. DOT officials do plan on developing the bike network in 2019. On the docket are 8.5 miles of improvements to the Jones Falls Trail, 0.6 miles in Port Covington, six miles along the West Baltimore Bike Boulevard. Including other initiatives, they will total 18 miles of bike lanes. Another 6.35 miles are proposed for 2020-2022. But Cornish notes that the projects listed on this year’s ledger are all from existing plans. They are holdovers from miles counted in 2017. And those targeted for 2020-2022 were supposed to be done this year. “Delaying projects. . . doesn’t mean you get to count them again,” she wrote. Meanwhile, bike advocates wonder if there are political reasons behind the administration’s lack of long-term investment in bike infrastructure. 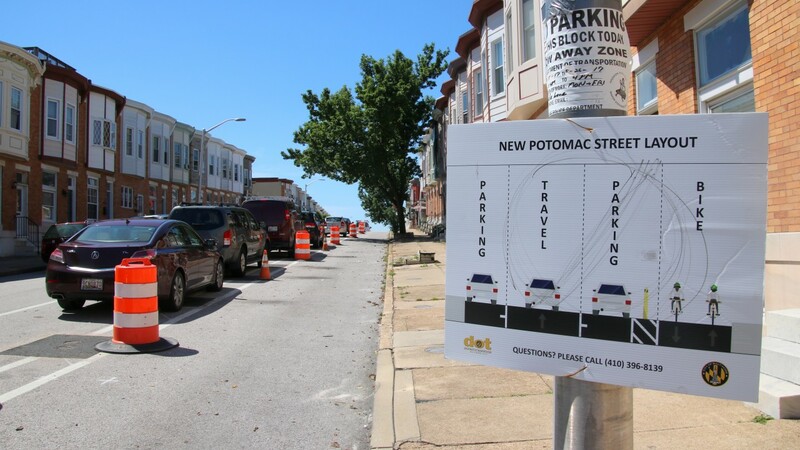 The standoff between the Fire Department and the Council over the Potomac Street bike lane brought year-long headaches to Mayor Catherine Pugh and James T. Smith Jr., her in-house advisor. Long-running hostility from residents over the layout of the Roland Avenue cycletrack hasn’t helped, either. “We’ve been charging ahead trying to do all that we can,” she answered. “But I must say that the day I showed up here to work, the city had been sued about the bike program; we ran into a lot of review and approval challenges. “So we really need to work with you to come up with an implementation strategy that’s aggressive but is doable,” Pourciau concluded. It’s not as if DOT currently holds no money for bicycling. Earmarked as “uncommitted funding” under DOT’s Bicycle Infrastructure umbrella is $7 million – $5 million of which is supposed to be dedicated to the Bicycle Master Plan. Pourciau said she has no idea what to do with that money. “We want to work closely with the Planning Department, as well as the state, to reconcile those numbers before we move forward with requesting additional funds,” she said. Jon M. Laria, who chairs the mayor’s Bicycle Commission, says DOT must keep the bike program moving. He suggested spending the $7 million, rather than keeping it banked for vaguely conceived future uses. It is scheduled to vote on the program on March 7. Happier days: Mayoral candidate Catherine Pugh poses with a Baltimore Bikeshare bike in 2016. The city ended the Bikeshare program last year. The chronology in the lawsuit against bus operator Transdev indicates DOT approved the payments for years after Kendrick left his job as deputy director.